Learning can be much simpler when teachers and students are using the same terms, and math class is no exception. Keep reading to find out how you can help your child remember elementary mathematics terminology. 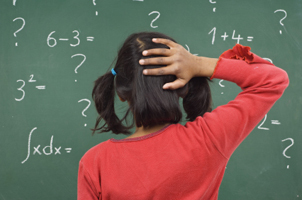 How Can My Child Practice Elementary Math Terms? Perhaps the most common way to memorize vocabulary terms is to use flashcards. Choose a term from your child's textbook, and write the word on one side of a flashcard and the definition on the other. Repeat this process with several terms. Then, use the flashcards to quiz your child for a few minutes each day. Repetition can help your child internalize the information. You also can play a vocabulary matching game with your child to review math terms. On one card, write the vocabulary term, and on another, write the definition. After recording all the terms that your child needs to know, shuffle the cards and place them upside down in rows on a table. Then, have your child turn over two cards at a time in an attempt to match a term with its definition. If your child needs consistent review throughout a specific math unit, you might have him or her create a math dictionary in the back of his or her notebook. This will provide a quick and easy reference during class and at home. Writing the definitions in his or her own words also can help your child to remember math terms. Additionally, you can encourage your child to include other memory aides, like sample problems or drawings. The leftmost number is in the ones column. For instance, in the number 12, two is in the ones column. The number to the right of the ones column is in the tens column. In the number 12, one is in the tens column. A coin worth 25 cents. Four quarters equal one dollar. A coin worth 10 cents. Ten dimes equal one dollar. A coin worth five cents. Twenty nickels equal one dollar. A coin worth one cent. One hundred pennies equal one dollar. The space inside a quadrilateral. Calculate area by multiplying length x width (a = l x w). For example, the area of a rectangle that's four centimeters long and two centimeters wide is eight square centimeters. The distance around an object. Calculate perimeter by adding the length of all sides. For example, a rectangle that's four centimeters long and two centimeters wide has a perimeter of 12 centimeters. In division, the number that's being divided. For example, in the question 20 ÷ 4, 20 is the dividend. In division, the number that's being divided into another. For example, in the problem 20 ÷ 4, four is the divisor.